Studio SG invited Michel to exhibit his photos and share them with friends and cocktails. His photos expose unexpected and beautiful forms founds on weathered walls and ancient doors. Michel Rosenfelder: It is the many years spent in fashion that triggered Michel Rosenfelder’s interest in unexpected aesthetic forms. The images fall into the categories: landscapes - portraits - textures - abstracts. During his travels, where others would bring back images of palaces and great landscapes, he would discover small passages photographing the walls of an old workshop in Asia or an angle of a wall in a popular area in New York. Through his eyes, surfaces eroded by humidity come to life. Battered by the rain and the sun their plaster is scaling of letting the shadows and light escape. A strange beauty drawn by an invisible hand in a place where no one would expect to find it. 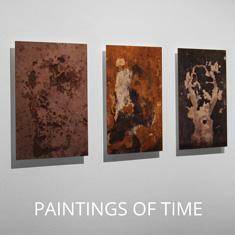 In places, they let their worn coating that time has coloured beautifully come to life. The cracks tell stories that only they hold the secret of. Built to protect, these walls open windows to imaginary images, visions of another world, abstract forms in soft colours like modern art paintings. Still, they breathe time and life. Anonymous, they reveal all facets of their character. It is the strength of these images revealing an unexpected beauty that is enhanced in the surprised look of the observer that drags us into a strange world journey, which resembles no other.